Emails obtained through an access to information request shed light on the creation of the controversial Lloydminster Record. City of Lloydminster staff pushed ahead the launch of a city-run “online news source” to September 2016 to start building “credibility” should the city’s Postmedia-owned newspaper, the Lloydminster Meridian Booster, close. Emails obtained through an access to information request by J-Source shed light on the creation of the controversial Lloydminster Record, which went online Sept. 7. 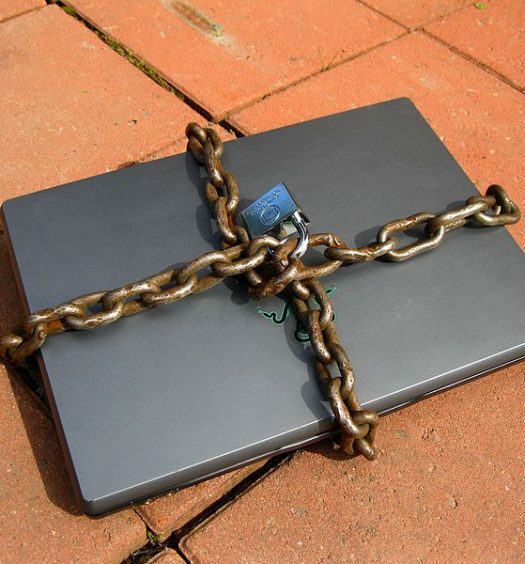 Although city officials have maintained they had no intention to replace the work of local journalists, the email trail suggests the Record was launched not only to counter “incorrect or misleading information” in media reports—but also to potentially fill an information vacuum should the local paper close its doors. On Mar. 15, 2016, Todd Corrigall, who was then the City of Lloydminster’s general manager of communications and marketing, emailed Leo Pare, who is currently acting general manager of communications and marketing, and Sharon Herbus, the former director of strategy and partnerships. In the email, Corrigall—now the City’s director of strategy and partnerships—speculated that Postmedia would centralize its news operations in three city centres, leading the company to “shutter all community publications” or “retain freelancers, have them work remotely, and submit electronically.” He included a link to a BNN story about U.S. company GoldenTree Asset Managment seeking buyers for its stake in Postmedia. 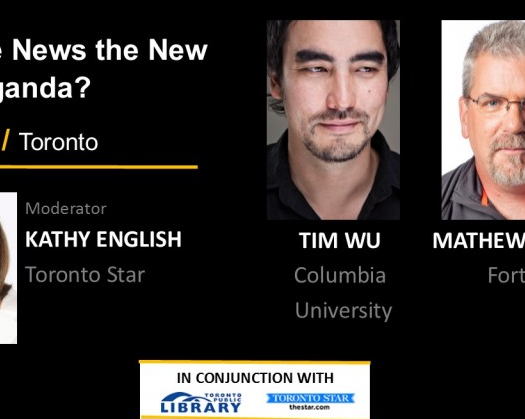 “Based on the current economic situation for Postmedia, I suspect this will happen within calendar year,” he wrote. To date, only one post appears on the webpage: ”City adds vital information to report on travel expenses.” The post states that “subsequent media reports omitted vital pieces of information” about travel expenses incurred by the city manager’s office and the subsequent access requests for those expenses. The post appears to be a direct response to a story written by James Wood, a news reporter and anchor for local radio station 106.1 The Goat, about the city clerk’s office releasing all the city’s accounts payable records. Wood declined to comment for this story. Corrigall, who confirmed to J-Source he was the lead on the project, continues to maintain this position. “The point behind this is providing that supplementary information,” he said. In any case, the Meridian Booster has continued publishing. On July 7, Postmedia announced a plan that President and CEO Paul Godfrey said will reduce its debt by approximately $307 million. Consolidation of the corporation’s Calgary and Edmonton dailies was announced in January 2016, but to date there been no subsquent announcements about closures of Postmedia newspapers in Saskatchewan and Alberta. Taylor Weaver, the regional managing editor at the Meridian Booster, said he had no comment on the email, which J-Source described to him over the phone. In an earlier interview with The Canadian Press he said had no problem with the city creating the Record, a position he still holds, he told J-Source. Zielke was paid for her design work, Corrigall confirmed, though he said he would need to check with her how much (Zielke has not yet responded to telephone and email requests for comment on this story.) “It’s part of a…approved budget,” he said, explaining that he believed Edmiston’s question to be in the context of the specific operations of the Record. Corrigall also told J-Source there was no specific news story that prompted the creation of the Record, saying he had been thinking of the idea for years, predating his time working for the City of Lloydminster, and that discussions about it began sometime around April or May of 2015, about a month after Corrigall started his job with the City. “It was more of, ‘Is there an opportunity to engage continuously and to have a vehicle to provide all that supplementary information?’” he said. Corrigall told J-Source he could not remember any stories that concerned him specifically at that time. After the launch of the Record, Corrigall did tell the Meridian Booster that the City had “no desire in writing our own articles or being perceived as a media organization,” comparing it to City of Kelowna’s For the Record, a web page on the city website that offers corrections and clarifications to news reports. 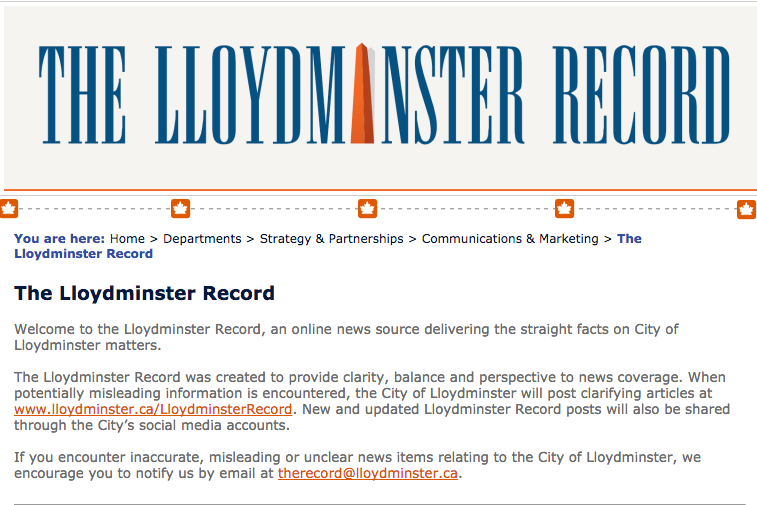 Unlike the Lloydminster Record, however, For the Record is not described as a “online news source” on its web page. However, J-Source spoke with two former Meridian Booster reporters who described the relationship differently. According to Myers, who left the Meridian Booster in early 2015, reporters were required to write down their questions for city councillors in advance of scrums. Corrigall told J-Source he discontinued that practice after he started working for the City in 2015. “We have to operate under the sense that it’s a good relationship because we’re not hearing anything from them directly,” he said. “Taking that into account we’ve certainly asked them ‘has (the Record) damaged our relationship with you guys? What do we need to do moving forward?’ That’s an ongoing conversation and discussion. It’s a critical relationship and we value it.” Corragill said he personally has only spoken with one member of the media, who said there was no problem with the Record if it is just providing supplementary information. Corragill added he has to “defer” to Pare about any additional conversations with members of the media. Corrigall said he would have to check with the City’s communications and marketing staff to see if another Lloydminster Record post is forthcoming. He added that city staff members are listening to feedback about the site. Emails show that City of Lloydminster staff closely monitored reaction to the Record after it was released, sharing links to all of the stories that were written about it. “Believe me, I pay attention to what’s been said out there and I certainly take it into account as we continue to refine the program.” said Corrigall. “I think all of the feedback that we get on anything we do is valuable in shaping what we do going forward and we’ll certainly continue the discussion about the Lloydminster Record,” he said.